Plant of the month. August 2014: HOLY HYDRANGEAS BATMAN – Glacier View Landscape and Design, Inc.
It’s August and the bats are flying at dusk, swooping for insects, mosquitoes, and my wife’s hair! But that’s OK because finally, the Hydrangeas are blooming! 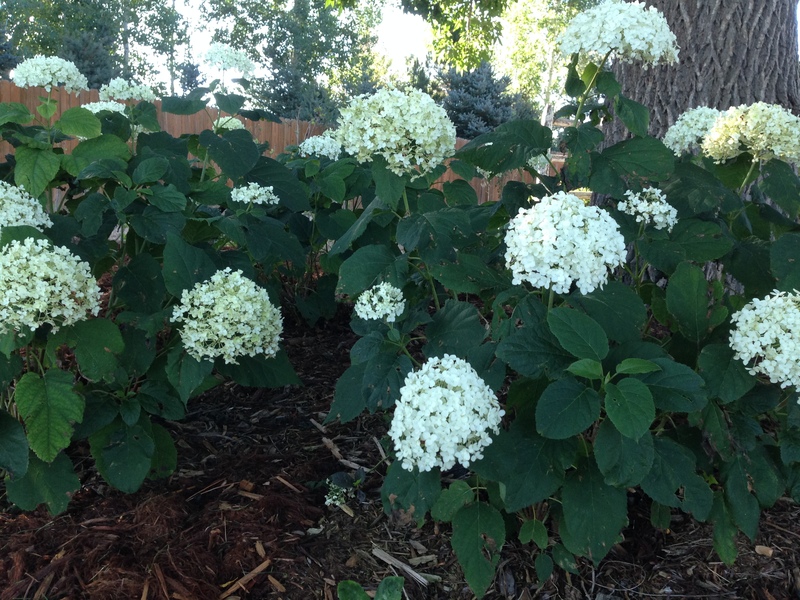 Hydrangea aborescens, macrophylla, paniculatta, and quercifolia are the four shrub types we grow here on the Front Range of Colorado and Hydrangea anomala petiolaris or Climbing Hydrangea as the one vine type. But please, let that fool you….some are quite difficult to site and get right the first time. They can be difficult to establish, and often do not survive the first winter. They are not for the homeowner who says “I want low maintenance” because that homeowner will not appreciate what it takes to make them thrive! The avid gardener will take great pride in having established Hydrangeas on their property. Most Hydrangeas prefer acidic soils, though some of the mopheads (the ones with the giant round ball flower heads) like Anabelle (aborescens) , Bella Anna, and the macrophylla cultivars such as Endless Summer, Incrediball, Blushing Bride, Everlasting Amethyst, and others can take alkaline soil. Endless summer will bloom blue in acidic soils and pink in alkaline soils….so expect pink in Colorado unless you amend with peatmoss or an acidic planter’s mix to raise the acidity levels or lower the pH. Twist-n-Shout is one of the so called ‘lacecap’ bloomers. Many of these ‘designer’ hydrangeas are now considered everblooming. They will continue to bloom all summer long since they bloom on the new year’s growth rather than on the previous year’s growth. The old standard Anabelle is a single bloom, meaning it puts out its blooms and then once they are done, that’s it for the season. But, I have found the old standard Anabelle to be much easier to establish. So, the designer mopheads are becoming quite popular, but buyer beware! They are hard to establish in Colorado. We are right on the border of their climate zone. The mophead designer developers claim 5b as the northern most climate, but some can go in 5a or even farther north if given the right protection and location. Mopheads prefer shade to partial sun, but little direct sun. They like protection from late spring freezes, and they do not like compacted soils. They need adequate moisture…often more than I realize…and they all must be pruned correctly. In short, all Hydranges should never be pruned, except to remove dead wood. There are two pruning methods depending on type. If you have mophead macrophylla or Oakleaf quercifolia then prune only in June or July. These set their blooms for the following summer in August or September, so you do not want to prune off the next year’s blooms. Endless Summer is an exception to this. If you have Anabelle aborescens or PeeGee paniculata, then these can be pruned to the ground in fall, or left to leaf out on old wood. If pruned to the ground, the new growth may not support the heavy flower heads the next year, so leaving some to leaf from old wood is best. The only time they should not be pruned is spring for Anabelle or Summer for PeeGee when they are getting ready to bloom. Finally, pruning does not include cutting of flowers for arrangements. That can and should be done both for the health of the plant and the health of the gardener! A great website on pruning rules for all the Hydrangeas is http://www.hydrangeashydrangeas.com/pruning.html . I encourage you to study this website thoroughly if interested in Hydrangeas for your garden. I could go on and on about pruning, care and feeding of Hydrangeas, but I want to touch on the non-mophead Hydrangeas as well. PeeGee or paniculata are an old standard in Colorado and around the world. This is a large 6-8’ shrub whereas the aborescens and macrophylla are smaller at 2-5’ depending on variety. PeeGee can be shaped and pruned into small trees for the Bonsai look. They have large cone shaped white flowers in summer that fade to pink in the fall. They also like filtered shade to shade, though I have seen some in almost full sun do quite well. The Oakleaf Hydrangea or quercifolia is also a large shrub at 8’ wide. It also has cone shaped flowers but has a distinctive oak shaped leaf with serrated edges. And, it has beautiful bronze to red and purple fall leaf color with blooms that also fade to pink as the fall progresses. And finally, Hydrangea anomala petiolaris or Climbing Hydrangea is a vine Hydrangea that can take full sun or shade and is quite adaptable. It prefers acidic soils and is slow to get established with horizontal vines that can help provide structure to the plant. Native to the Himalayas and China, this vine is vigorous once established and can grow to 40’ or so. It blooms white in summer and is a great addition to a garden fence, trellis, stone wall, or railed porch or deck.Plant Hydrangeas as a backdrop to a shade garden and watch them come alive in the summer. Enjoy! We’re proud to serve communities near Frederick, Colorado with our landscape design & installation services.